What a fabulous venue Bobby Herdman chose to stage this all Ireland contest. Competitors came far and wide from all over this emerald isle. 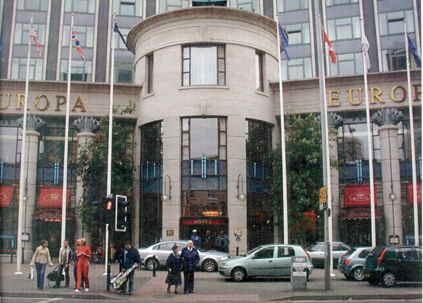 Lured not only by the prospect of appearing at this amazing venue, (Belfast’s 5star hotel, and Europe’s most bombed), and winning one of the superb trophies, but also of winning over £1000 in prize money, and qualifying for the IBFA EUROPE in ITALY next year. Yes, two lucky competitors will be chosen at a later date, and sponsored with SCIENCE in SPORT products, then flown out to Italy next July to compete. Last but certainly not least ON stage came one of the biggest bodybuilders in Britain, if not in the WORLD, the enormous TREVOR CHROUCH.